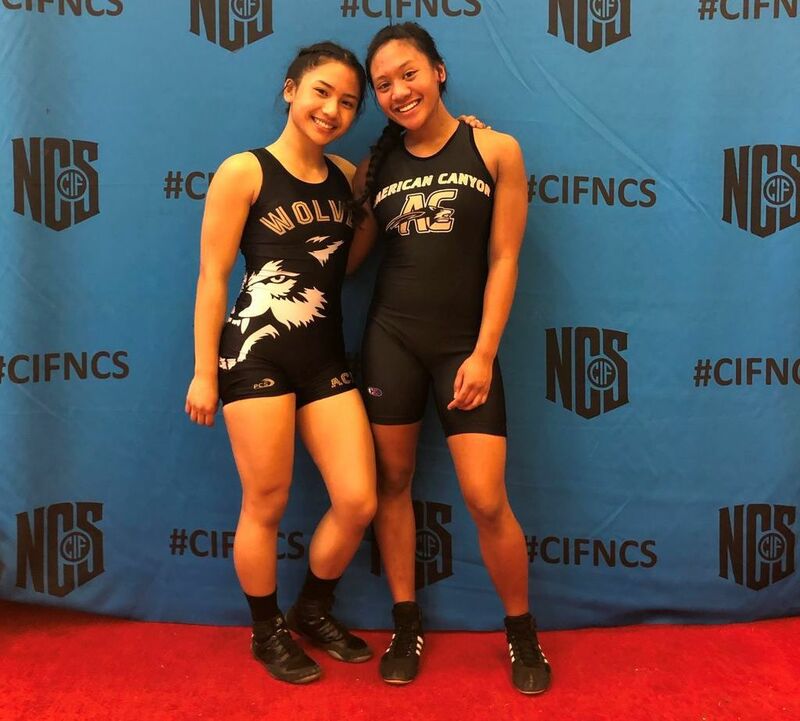 American Canyon's state meet-bound senior wrestler, Yvonne Cruz, left, poses with teammate Alyssa Sapida after Saturday's final rounds of the CIF North Coast Section Girls Championships at Albany High. American Canyon wrestler Aaron Villa Carlos, top, competes in the CIF North Coast Section Championships on Friday at James Logan High in Union City. Napa High's Cole Lex, top, competes in the CIF North Coast Section Championships on Friday at James Logan High in Union City. Napa High 126-pounder Brandon Bledsoe, right, competes in the CIF North Coast Section Championships on Friday at James Logan High in Union City. Vintage's Tucker Lanoue, left, holds on for a 6-2 win over host James Logan's Airamis Mendoza at 152 pounds during the CIF North Coast Section Championships on Friday in Union City. Justin-Siena 120-pounder Jacob Guiducci, left, competes in the CIF North Coast Section Championships on Friday at James Logan High in Union City. American Canyon 285-pounder Jesus Sanchez, left, pins St. Patrick-St. Vincent's August Gawiran in the second round of the CIF North Coast Section Championships on Friday at James Logan High in Union City. Napa High senior 182-pounder Chase LaRue, top, competes the CIF North Coast Section Championships on Friday at James Logan High in Union City. American Canyon senior Yvonne Cruz placed second at 116 pounds with a 4-1 record to lead Napa County wrestlers at Friday and Saturday’s CIF North Coast Section Girls Championships at Albany High. She and the other top-four placers qualified for the next weekend’s girls and boys state meet at Rabobank Arena in Bakersfield. The top eight in each weight class received medals, including Napa High’s Stephania Barrientos (fifth) and Vintage’s Jessica Mendieta (fifth), Leilani Frazer (sixth) and Romina Castro (eighth). After a first-round bye, Cruz pinned Scout Bates of St. Patrick-St. Vincent in the first period (1:23), pinned Newark Memorial’s Analicia Parish in the quarterfinals in 56 seconds, and won an 8-3 decision over Albany’s Tamsin Urbas in the semifinals. In the final, she was pinned by Alisha Narvaez of Arroyo-San Lorenzo in 2:00. American Canyon’s Alyssa Sapida (126) also reached the second day and finished 3-2. After pinning Arcata’s Skaidra Pulley in 4:20, she was pinned by Benicia’s Chloe Cheung in 5:28. She came back by pinning San Lorenzo’s Adalize Wilson in 4:40, and winning an 8-1 decision over Windsor’s Bianca Correa, before getting pinned by Eureka’s Kelli Johnston in 2:19. Barrientos (111) placed fifth with a 5-2 record. The freshman pinned Alhambra’s Aerolon Nhingsavath in 3:52 and Eureka’s Dulce Pimentel-Hulburt in 24 seconds to reach the quarterfinals, where she was pinned in 1:50 by Benicia’s Mia Bonotan. She came back by pinning Clayton Valley’s Maddie LaVenture in 30 seconds and James Logan’s Vienna Garcia in 2:05, before dropping an 8-2 decision to Albany’s Gurleen Bhullar and winning the fifth-place match by injury default over Windsor’s Ivory Osborn. Frazer (137), after a bye, pinned Miramonte’s Shannon Lipp in 1:37, won her quarterfinal over Skyline’s Imani Salter, 5-2, was pinned by Albany’s Joanna Qui in 4:35 and Livermore’s Ximena Pulido in 4:44, before getting pinned in 15 seconds by Santa Rosa High’s Daniela Botello-Zetina in the fifth-place match. Mendieta (170) got a bye before dropping a 7-5 decision to San Marin’s Lily El-Masri. She then won three straight consolation matches by pin – over Willits’ Isabella Nunez in 1:39, Dublin’s Raquel Espinosa in 2:26, and Berkeley’s Veronica Lerman in 1:11. After losing a 6-1 decision to San Leandro’s Kendall Branchaud, Mendieta won the fifth-place match over Ukiah’s Yulisa Vega. Castro (150) pinned Dougherty Valley’s Aavinit Kaour in 1:26 and Santa Rosa High’s Janely Rodriguez Reyna in 3:48, lost her quarterfinal to Newark Memorial’s Sierra Van Rossem on a 3-2 decision. She came back with a 3:40 pin of Montgomery’s Bianca Gomez in 3:40, but got pinned in 1:23 by Benicia’s Gabriella Tuttle and, in the seventh-place match, by Castro Valley’s Olivia Ott in 3:27. Vintage’s other seven competitors were eliminated Friday. Natalie Scott (111) went 3-2, winning a 5-0 decision, losing a 5-2 decision, winning 3-0 and by pin in 1:52, before bowing out with a 7-2 loss. Delani Stiles-Warner (121) finished 2-2 after pinning her first foe in 1:31, getting pinned in 2:45, winning with a 13-second pin, and losing by pin in 1:38. Erika Eberhardt (160) also went 3-2. She won via pin in 2:39, lost on a 3:55 pin, pinned two consolation foes in 1:00 and 2:08, and got pinned in 2:05. Kim Navarrete (235) went 2-2 with two byes while losing by pin in 47 seconds and 2:15. Alison Lopez-Hernandez (106) bounced back from a first-round loss with a consolation pin, but lost a 4-3 decision to finish her season with a 12-11 record. Aspen Dikeman (116) was pinned in her first match and pinned her second foe before bowing out with a 9-1 loss and finishing 4-10 overall. Savannah Michael 143) went 1-2, getting a first-round pin and bowing out with a 6-3 loss and finishing 10-15 on the season. Napa High’s Liliana Garrido (137) lost both matches on Friday. American Canyon senior Aaron Villa Carlos and Napa High sophomore Cole Lex were the only Napa County wrestlers to finish in the top eight at Friday and Saturday’s CIF North Coast Section Championships at James Logan High in Union. Villa Carlos placed sixth at 132 pounds and Lex was eighth at 285s. Only the the top three in each weight class advanced to the state meet. After winning a 9-0 decision over Northgate’s Angelo Esposito and beating Windsor’s Brennan Brown 8-5, he was pinned in 4:47 by Liberty’s Cade Martinez-Ignatov in the quarterfinals. But he came back with a 15-2 decision over Napa High’s Brandon Bledsoe and a 4:53 pin of Lower Lake’s Hugo Salazar. After a falling 8-5 to Benicia’s Basil Othman, he was pinned by Martinez Ignatov in the fifth-place match in 4:09. Lex blanked California-San Ramon’s Luke Nye 7-0 before getting pinned by Freedom’s Caleb Hunter in the quarterfinals in 3:25. He battled back with five straight consolation victories – a forfeit, a 1:37 pin of Concord’s Alejandro Escobedo, an 8-5 decision over Heritage’s Sebastian Davis, a 2:06 pin of Ukiah’s Brandon Vargas and a 3:57 pin of Vintage’s Konrad Fiske – before getting pinned by Hunter again, in 2:05. Lex was pinned in the seventh-place match by Casa Grande’s Jack Faris in 2:17. Nine other local grapplers also made it to the second day. Vintage senior Tucker Lanoue (154) won by pin in 4:18 and by decision, 6-2, before getting pinned in the quarterfinals and getting injured in his consolation opener while getting pinned in 2:51. Fiske (287), a junior also won his first two, including one by pin over a Rosa High junior who came in with a 25-1 record, but lost his next two. Vintage juniors Dominic Smith (220) and Saul Valle (170) each lost his first match on Saturday. American Canyon senior Alec Hoover (160) went 2-2 and sophomore Devin Garingarao (126) finished 3-2 after losing his opener. Wolves who went 2-2 and were eliminated Friday were senior Jesus Sanchez (285) and sophomore Elijah Beronilla (113). Napa High had two others make it to Saturday – senior Chase LaRue (182), who went 3-2, and Bledsoe (132), a junior who was 4-2. For Justin-Siena, sophomore Jacob Guiducci (120) got to Saturday’s round and finished 3-2. Freshman teammates Cooper Cohee (106) and Caden Parlett (126) each went 1-2, Parlett making the field as an at-large alternate.